Just as I was finally settling into Luanda and getting used to the pace of life there, it was time for me to leave. Hubby has business back in London and I have come along with him. Even though I was really enjoying the sights and sounds – but not necessarily the smells – of Luanda, it was impossible to pass up ten days of shows, shopping and no cooking! My mama didn’t raise a fool, y’all! The only wrinkle in my little plan is the unfathomably complicated visa process for Angola. Because I do not have my work visa yet, I cannot go back to Luanda when our London trip is done. I will have to go back to the states until my visa is ready – whenever that is. After almost three months of waiting, my husband’s visa is still not back, and his has to be returned before mine can even be submitted. Clearly, this could take awhile. The visa office is in no hurry to let us pesky foreigners into the country and no amount of fussing and hollering will make one iota of difference. As I have said in previous blogs, life in Luanda is all about waiting – for absolutely everything. So, here I am in London making the best of things. Sigh. One can never count on the weather in London, but one can always count on plenty to see and do. Within hours of landing, Hubby headed to the office and I headed to a huge annual holiday market, the Spirit of Christmas Fair, with some friends. Don’t judge – we all have our roles! This market is enormous – every bit as big as the Nutcracker Market in Houston, for those of you who are familiar with that behemoth. Set in a large two-story exhibit hall, one can literally shop-till-you-drop for every conceivable gift or specialty food item. For someone who was operating on only three hours sleep, I managed to cover the entire building and find a few treasures. Yep, I’m pretty tough when properly motivated. Luckily for my husband, London has so much more to offer than just shopping. 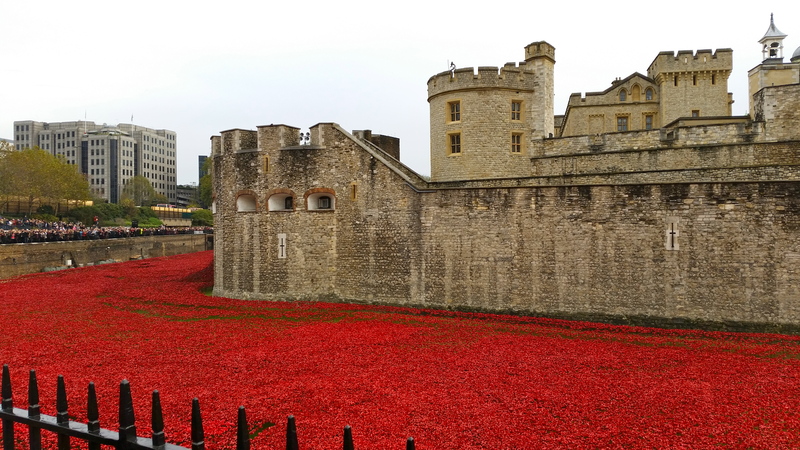 On Saturday, we were fortunate enough to catch the ‘Poppies at the Tower’ display on its crowning weekend (see https://poppies.hrp.org.uk/about-the-installation). This is a commemoration of the nearly 900,000 fallen British soldiers of WWI. 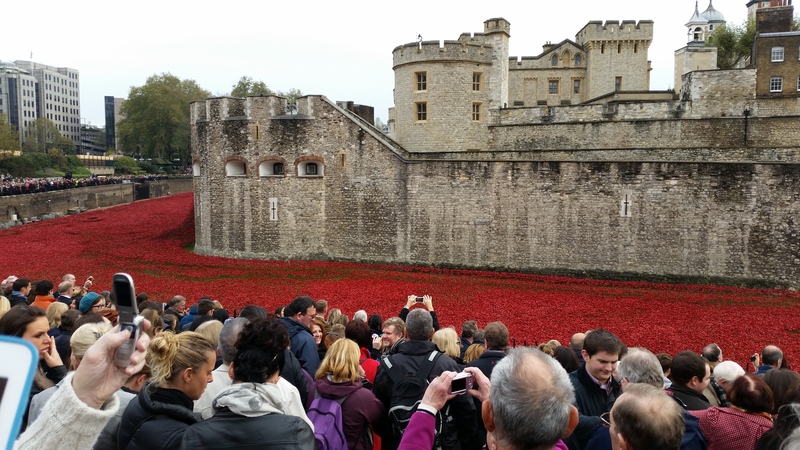 Each soldier is represented by a red ceramic poppy placed one-by-one in the moat of the Tower of London. 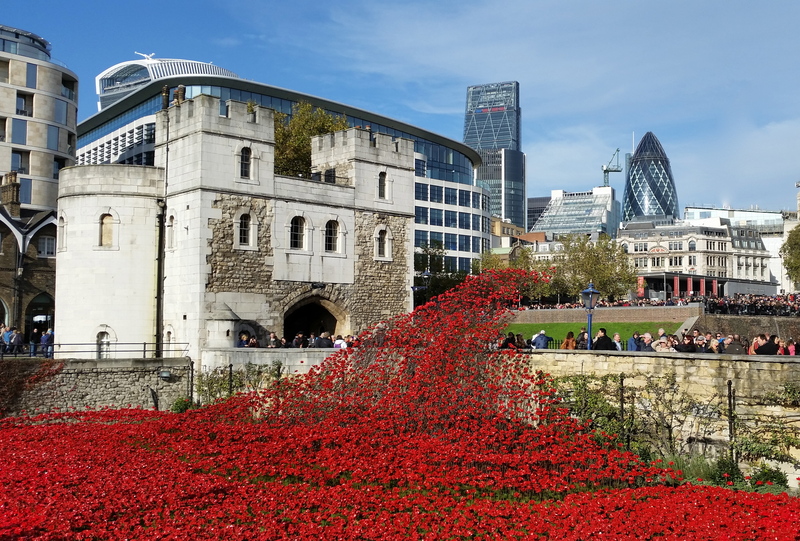 Volunteers have been placing the poppies throughout the summer and the final effect is truly breathtaking. 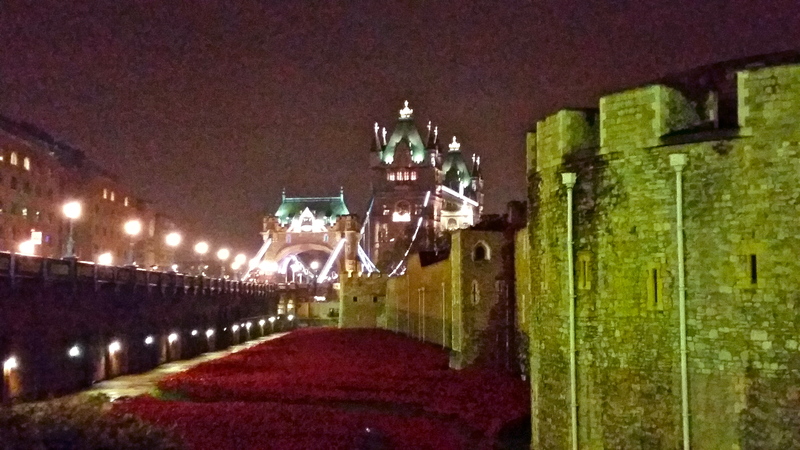 After a wonderful steak dinner at Hawksmoor and the thought-provoking King Charles III play on Saturday night, we wandered over to the Tower to see the poppies all lit up at night. The next morning, Remembrance Sunday, we braved the masses again and managed to arrive just in time for a moment of silence beside the moat. The huge, bustling crowd remained respectfully silent and still for a full two minutes. The only sounds we heard were birds chirping as they circled overhead and a band playing faintly in the distance. It was very moving and a lovely tribute to those brave soldiers. I had hoped to purchase a poppy as a remembrance of the event, but all 888,246 poppies have been sold! At 25 GBP each, this means a whopping sum raised for veterans causes. It was a very successful event in so many ways! iPhones up! 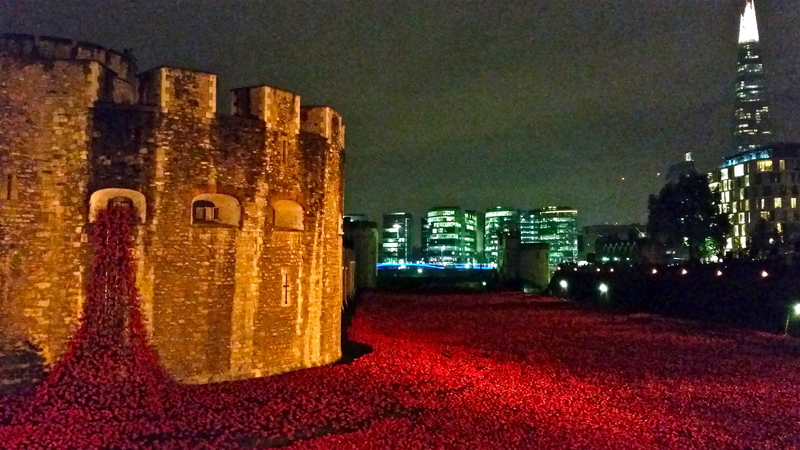 I dare say that at least 900,000 photos have been taken of these famous poppies! 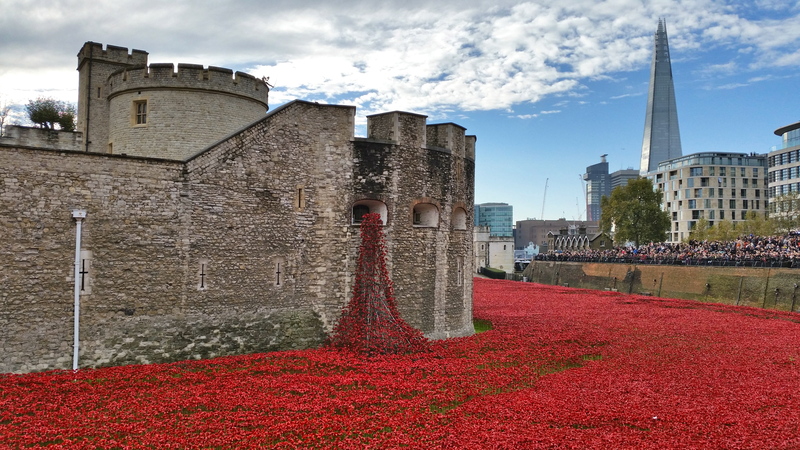 Poppies at the Tower – A waterfall of poppies coming from a Tower window. Volunteers have been placing these poppies all summer. Quite an undertaking! A fitting tribute to the fallen of an often forgotten war. 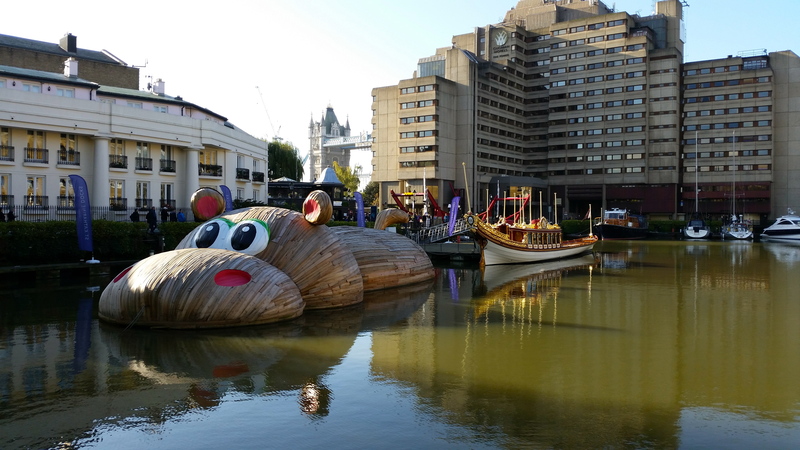 Never ones to waste a sunny London day, we decided to take in a few more sights and then enjoy another great London tradition, a Sunday Roast at a busy pub. 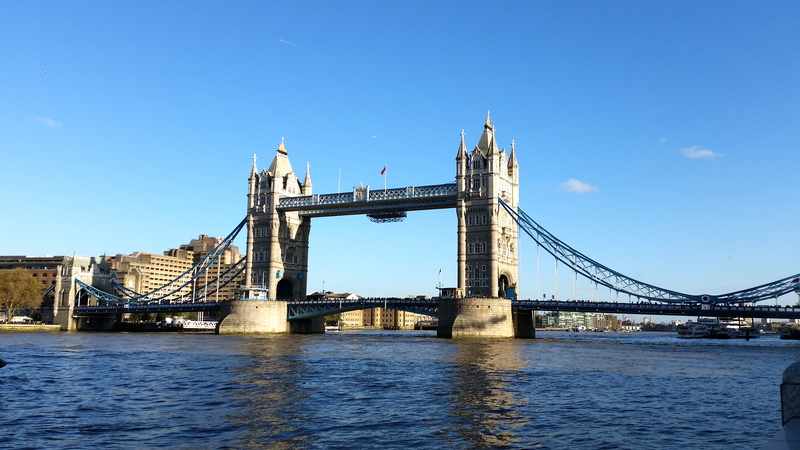 We wandered along both sides of the Thames, enjoying the sunshine and great people watching. The Tower Bridge is always a favorite sight. 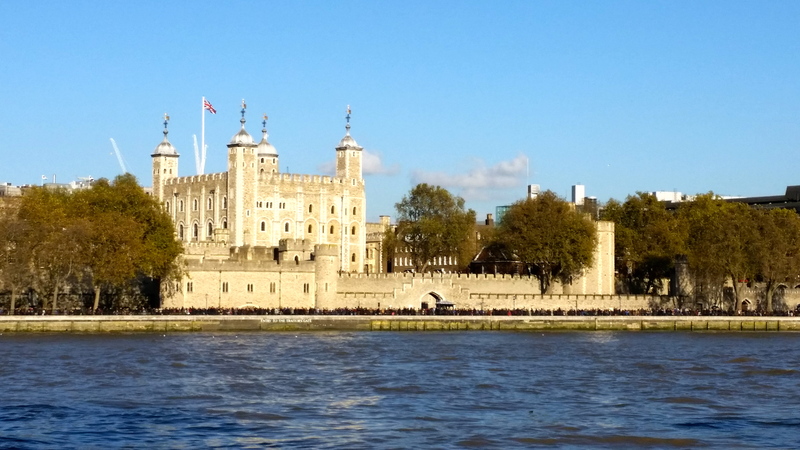 The Tower from across the Thames. It has been wonderful taking in the buzz of this fabulous city and catching up with friends. My time here will go quickly as it always does. Even after living here for over three years, I have yet to scratch the surface. Better get cracking, time’s a wasting!